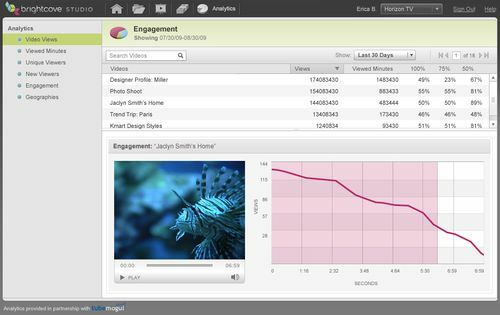 The recently announced Brightcove 4 platform provides TubeMogul's suite of market-leading online video analytics as a standard, out-of-the-box feature for no additional charge to Brightcove customers of all editions. Some of these analytics include viewer engagement and drop off, unique and new users, and geographic distribution, among other reports. The partnership also includes a joint R&D pact. Engineers from Brightcove and TubeMogul are working closely together on next-generation advanced online video analytics that will be made available exclusively for the Brightcove platform and rolled out in 2010. The partnership between Brightcove and TubeMogul also provides a framework for joint marketing and business development activities including promotions for the new $99/month Brightcove Express product line targeting the more than 125,000 video pros who already use TubeMogul's free video analytics. The is a great partnership that will drive value for our two companies and bring a powerful suite of new analytics to Brightcove's global customer base of more than 800 customers across 34 countries.